Hemlock Valley has 35 runs serviced by 5 lifts. It opens for night skiing. Backcountry terrain is accessible. Hemlock terrain park contains medium and small features. Visitors can partake in other activities like apres-ski at Hemlock. Discount Hemlock Valley Tickets ← Save up to $5! 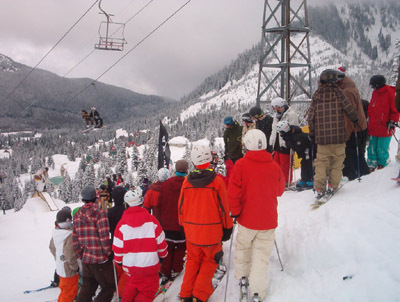 Hemlock Valley Resort is located in the Fraser Valley, close to Chilliwack, Mission and Abbotsford. The road up is gnarly but once you make it to the lodge it's a nice little area. Four lifts service the ski area which is 121 hectares with a 400m vertical drop. As the only ski hill within an hour's drive for eastern Greater Vancouver, it's easy to see the potential at Hemlock. This has reportedly motivated owners to forge an aggressive expansion plan. Book a Hotel/Hostel Room for Hemlock Valley ← Low Price Guarantee!